Fact: Using our portable equipment, meaningful and engaging exercises can be done indoors. This allows programs to be done year round regardless of the weather. This portable equipment can even be brought to your location or other third party locations like a hotel, park or conference center. Fact: False. More important than physical fitness is a group’s willingness to try new things and get outside their comfort zone. A good sense of humor helps a lot. Fact: Not required. Many fun and high-energy exercises are done on the ground. Challenge courses operate on a challenge by choice so participants can choose to “opt out” of a particular exercise or contribute in other ways that eliminates the need to go up in the air. There are many creative exercises that develop team spirit. Fact: Many people are uncomfortable with touching people they do not know. That is why we work on getting people to know each other first. Even then, exercises can be created the do not require participants to touch each other. Fact: Team building is used to get people to know each other, build trust, improve communication, stimulate problem solving, and foster collaboration amongst team members. Team building can be very effective at building and improving relationships. What worked and what did not go so well? How does this relate to what happens in (work, school, home)? 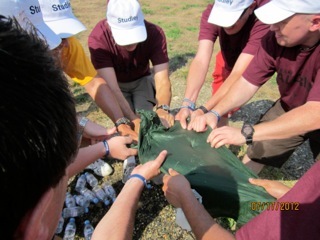 Fact: Team building is very specific to the groups’ demographics, challenges they are facing, and goals. Meaningful half-day programs can be developed that are sensitive to downtime concerns and budget constraints. To get five great team building exercises you can do yourself, click here or call us at 301-725-1313. We would be happy to start a conversation with you about your groups’ goals. This entry was posted on Tuesday, November 4th, 2014 at 10:00 am. Both comments and pings are currently closed.